When De’Anthony Harris was released from Grafton Correctional Institution last October, he had a new outlook on his future. 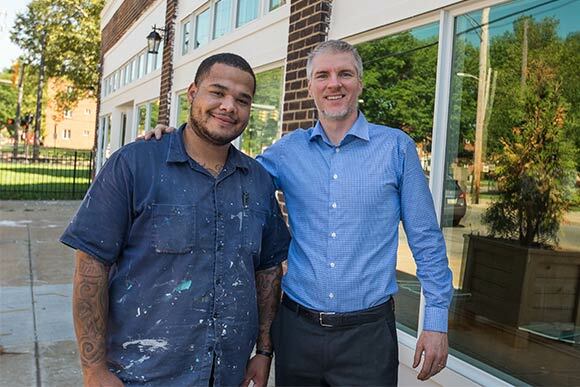 And, thanks to Brandon Chrostowski, owner of EDWINS Leadership and Restaurant Institute on Shaker Square, Harris also has a second chance at a successful life. Harris enrolled in Chrostowski’s culinary training class at Grafton. He also earned his temporary commercial driver's license (CDL) for truck driving, a certification in pet grooming and any took just about any other workforce training program the prison offered. Chrostowski opened EDWINS in November 2013. The restaurant employs former inmates in Ohio prisons to teaches them the inside ropes of an upscale French restaurant. EDWINS has graduated 145 students men and women, with another 30 graduating in December. A new class of 30 started on August 8 and will begin working at the restaurant today. In addition to the restaurant, Chrostowski has been busy building the EDWINS Second Chance Life Skills Center in the Buckeye neighborhood to further help his students get a solid fresh start. 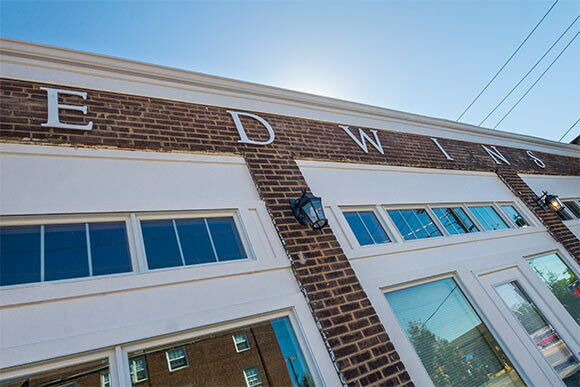 Edwin is not only Chrostowski’s middle name, it also stands for “Education Wins,” says Chrostowski – the whole mission of the restaurant and the skills center campus. When phase two of the project is officially completed next week, Harris will serve as the Resident Advisor (RA) in the student housing dormitories on the 20,000-sqaure-foot campus on the corner of South Moreland and Buckeye in Cleveland’s Buckeye neighborhood. After beginning the $1.3 million construction project on the EDWINS campus late last July, Chrostowski has transformed a once-rundown and somewhat abandoned portion of the street into a vibrant neighborhood. The campus's three buildings house an 8,000-square-foot, a three-story dorm, an eight-bedroom alumni house for EDWINS graduates, a fitness room, weight room, library and test kitchen. 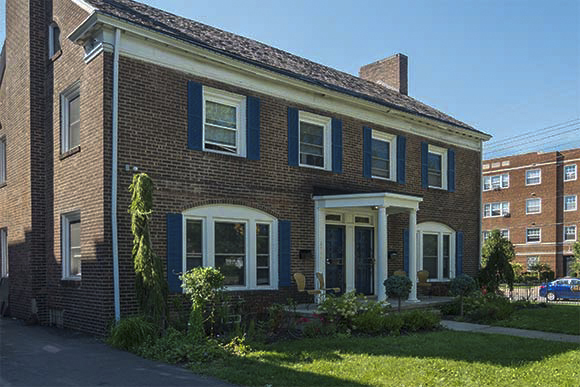 Chrostowski extensively renovated and remodeled the interior spaces and spruced up the exterior with landscaping and freshly painted trim on the exteriors of the red-brick buildings. Much of the material and labor was done at or below cost by area contractors. From the front of the library building, a sign touting "EDWINS" adorns new a glass front. Chrostowski is expecting granite glass tiles to be delivered any day now, sold below cost to EDWINS by Solon-based Granex Industries, which will border the bottom of the front windows. Fir trees in square wooden planters welcome passersby on the street. The building that houses the newly-painted EDWINS library and test kitchen was in disrepair when Chrostowski took ownership of the property. Just 13 months and $480,000 later, thanks to generous donations and fundraising, the building features new plumbing and electrical. “The building was a total wreck,” Chrostowski recalls as he looks around the renovated room, which at one time was filled with garbage and dead animals. Bookshelves and eight computers line the library’s walls, each with internet access and all of Chrostowski’s lessons via Grafton’s Hope Channel. The library shelves are already stacked with about 100 culinary books. The collection continues to grow. “I want to build the biggest culinary library in the state,” Chrostowski says, adding that he hopes to accumulate 1,000 books. Adjacent to the library is the test kitchen, with state-of-the-art equipment for the residents to hone their culinary skills and experiment with new recipes. “The dream is to always be around food,” Chrostowski explains of the setup. Down the hall, past administrative offices, are lockers and showers next to an exercise room with workout equipment and a large-screen television, while the basement houses a weight lifting room. Another basement area is filled with donations of household goods, which will be sold in a planned store. Beachwood-based Thomas Brick Company donated 10 pallets of tile for the test kitchen and locker rooms. On the roof of the building are hives with 20,000 Italian honeybees, whose honey is harvested for many of EDWINS’ recipes. Below is a full sized basketball court, a greenhouse and a chicken coop that is home to three chickens. “The greenhouse will be the spring incubator for our summer vegetables,” Chrostowski explains. 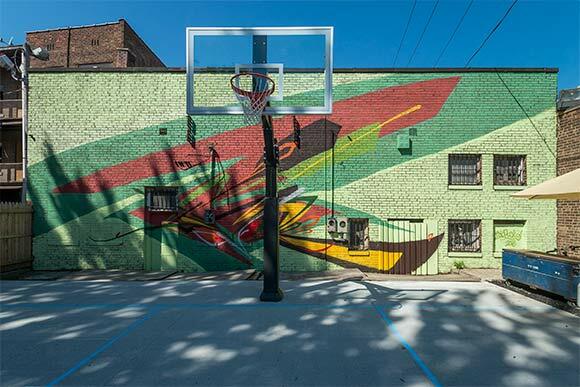 Chrostowski recruited Lakewood artist Bob Peck to paint a mural on the wall abutting the basketball court. Chrostowski hopes to acquire the currently-vacant building from the Cuyahoga Land Bank for a future butcher shop. The dorm houses seven apartment suites with room for about 20 students. The suites feature living areas, bedrooms and, of course, full-equipped kitchens. While phase two is nearly complete, Chrostowski already has his sights set on the next phase of his dream to not only give former convicts a second chance at a productive, fulfilling life, but to revitalize the Buckeye neighborhood. Chrostowski is eying a home just behind the EDWINS campus that he hopes to buy and convert into family housing for students. In addition to the buildings directly next door, he's also watching a couple of buildings down the street that would make good storefronts for a future fish market and butcher shop. With the help of Jones Day, Chrostowski has set up the EDWINS Foundation to cover costs for current and future endeavors. For Harris, the campus feels like home. He’s busy managing the final construction jobs, “giving a helping hand wherever needed and physical labor,” while also enforcing curfews and calming residents’ disputes as a certified mediator. “It works, it really does work,” he says of the mediation skills he learned at Cleveland State.